The Indian Navy invites applications from unmarried Engineers for grant of Permanent Commission (PC) & Short Service Commission (SSC) in Executive Branch (General Services/IT) and Technical Branch (Engineering, Electrical & Naval Architecture Branch) of the Indian Navy under University Entry Scheme (UES) for June 2019 Course. All the eligible candidates can apply from 30 June 2018 to 30 July 2018. Born between 02 Jul 1995 to 01 Jul 1998 both dates inclusive. All relevant documents (preferably in original) date of birth proof (10th & 12th certificate), 10th mark sheet, 12th mark sheet and mark sheets till 5th /7th semester of regular BE/ B Tech and Integrated Course respectively, BE/ B Tech CGPA to % conversion formula and a recent passport size color photograph should be scanned for attaching the same while filling up the application. Print 2 copies of this filled application form which has system generated application number. Carry one copy of application during Campus Interview. Another copy of application is to be carried along with original documents/certificates as mentioned in Para 5 (c) above while appearing for SSB. The eligible candidates will have to undergo Naval Campus Selection process. The Candidates qualifying the campus interview will be shortlisted for SSB interview on the basis of his/her preference for the entry, subject to meeting the eligibility criteria for particular entry. In case of excess candidates IHQ/MOD (Navy) reserves the right to further shortlist and fix cut-off percentage. Candidates shortlisted during campus interview will be called for SSB interview at Bangalore/ Bhopal/ Coimbatore/Visakhapatnam/Kolkata between Dec 18 to Apr 19. Selected candidates will be informed about their selection for SSB interview on their E-mail as provided by candidates in their application form. 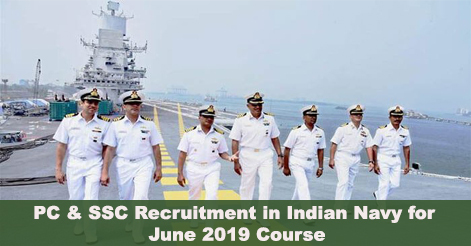 Help us to improve this article/job posting "Short Service & Permanent Commission Recruitment in Indian Navy for June 2019 Course". We would be glad if you can comment below and provide your valuable suggestions and feedback. If this page have any wrong information/list or out of context content, then you can report us as well.